The new Christopher Robin movie is coming out August 3rd! Follow along this week as I bring you interviews with the cast and crew of the Christopher Robin movie! 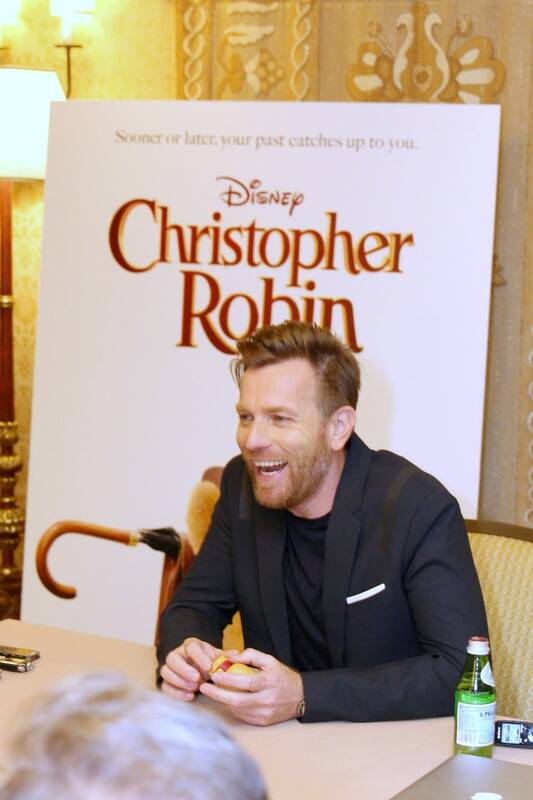 Today we are sitting down with Christopher Robin himself, Ewan McGregor. A huge thank you to Disney for inviting me to the world premiere of the Christopher Robin movie and flying me out to LA. All opinions are 100% mine. 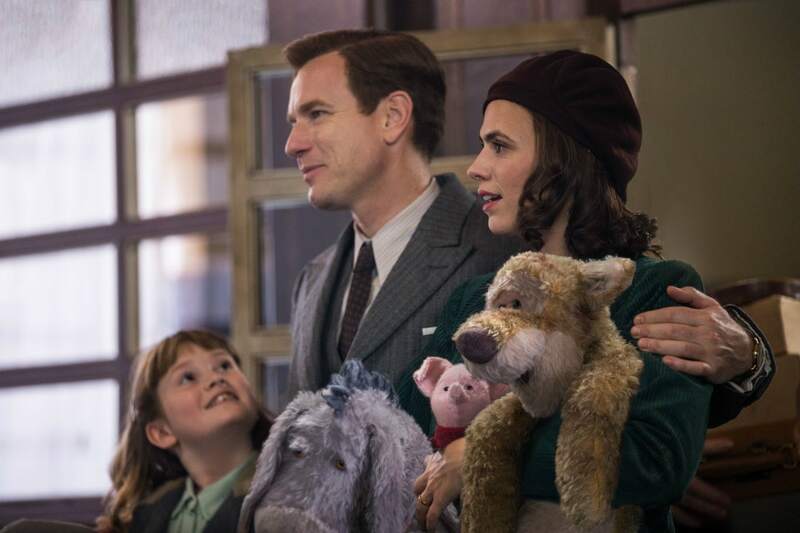 Ewan McGregor has played many different roles in his career, most recently the title character Christopher Robin in the new film releasing August 3rd. 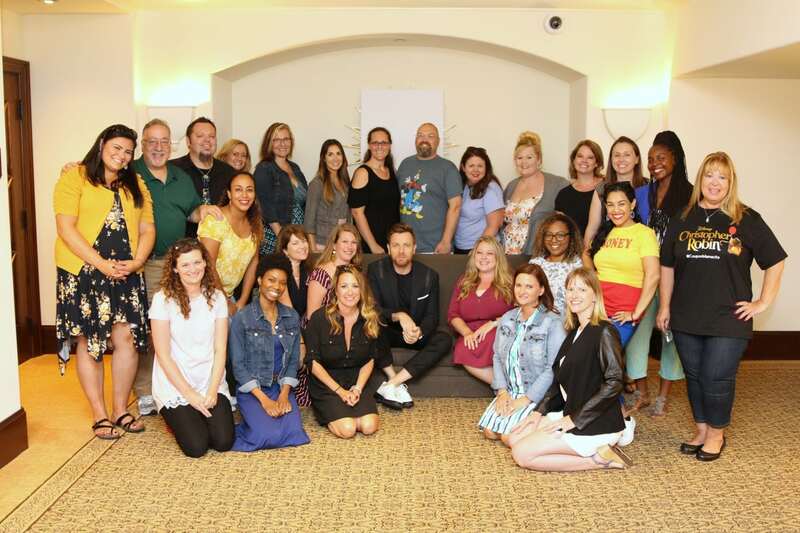 This past week, I had the privilege of interviewing Ewan about what it was like portraying a very iconic character that everyone knows and loves. 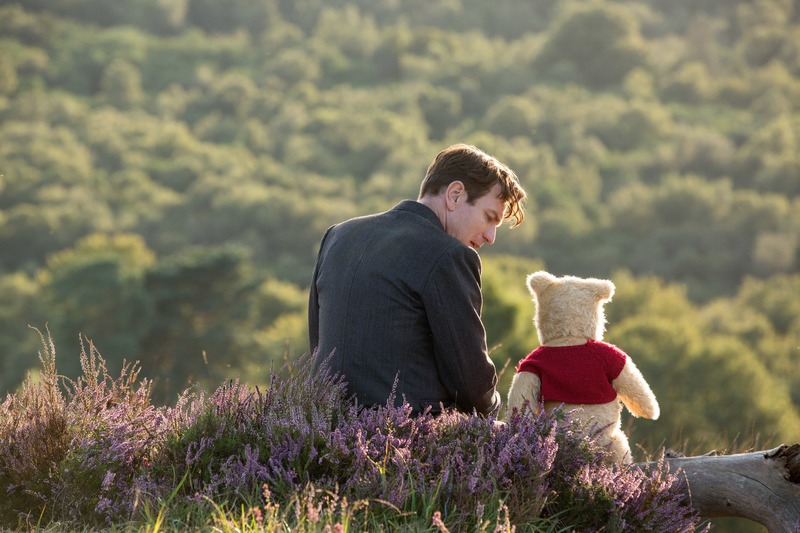 Ewan McGregor plays Christopher Robin opposite his longtime friend Winnie the Pooh in Disney’s heartwarming live action adventure CHRISTOPHER ROBIN. Photo Credit: Disney. I often wondered if there is a lot of pressure for actors when they are playing a character that everyone grew up with. Is it more difficult for an actor to play a person we all think we already know, or is it just like any other role? We asked Ewan about that and he made a really good point I hadn’t thought about. I mean we know of the story of the real Christopher Robin… but nobody really knows about Christopher Robin as a forty year old man. He is absolutely right. This character is all grown up and is being reintroduced in an all-new adventure. Ewan said that he felt like he knew who the older Christopher Robin would be and that he knew how he wanted to portray him. I felt like I knew him, I just knew him. I felt like it was just the right part for me to play at this point, in this time. And I absolutely knew what I wanted to do with him. So I didn’t have a lot of trepidations. I think any of that kind of fear is usually a good idea to do. It’s better to do stuff you’re slightly scared of than not. Actors such as Ewan McGregor often have many different roles they can choose from. 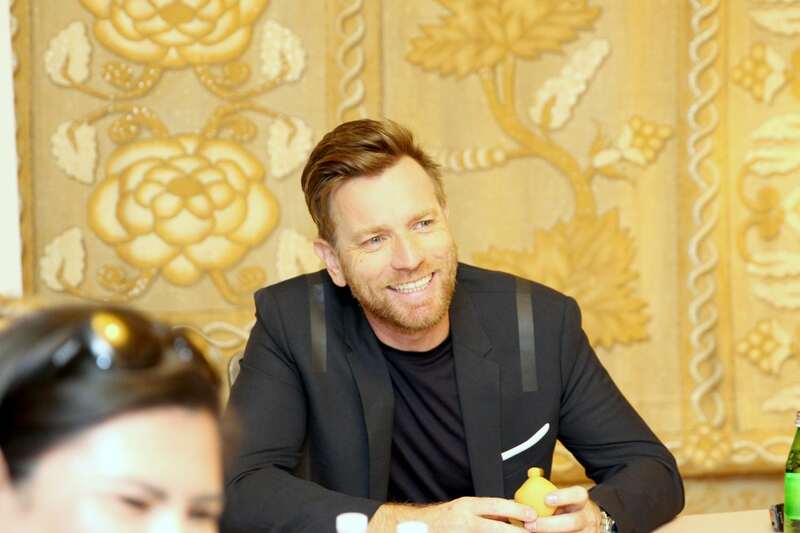 Ewan talked about what inspired him to take this role. I think what inspired me was the way Marc spoke about it first. He called me and told me he was going to direct it and described to me, how he saw it, and what he thought it could be. And how this movie could be a good film for people to watch at this point in time. That was really what inspired me. And then the lovely script, I really liked reading it. I think we all have a favorite Winnie the Pooh character. I am in love with the Bear himself. My daughter’s favorite is Piglet, and my son just thinks Eeyore is the best! We were curious if Ewan had a favorite and he talked about how he really loves them all. He talked about spending time with a few of them during the shooting of the film. Pooh is the one I spent the most time with. And he’s definitely my guy… like my little side kick. I learned a lot from him because he’s very wise, he’s got a great wisdom, Pooh. But I also liked Eeyore… He’s just so depressed. I mean not we’re not meant to say depressed. Disney don’t like it. But he’s so glum, glum isn’t he. Down in the dumps. So he’s sort of fun too, because he makes you feel so happy when you’re with him. But I love them all. I tell you who’s lovely was Kanga, because she was the only it’s one of the few female characters of the bunch. And the mom. And she was the very calming voice in this sequence around the log, where I when I go off to fight the Heffalump and come back, she’s definitely the most sort of calming and she’s the maternal character of the bunch. We asked Ewan about the message of the movie and what he thought people would get out of it. I think it’s just about connection isn’t it, it’s about being available to each other and being there, being present. 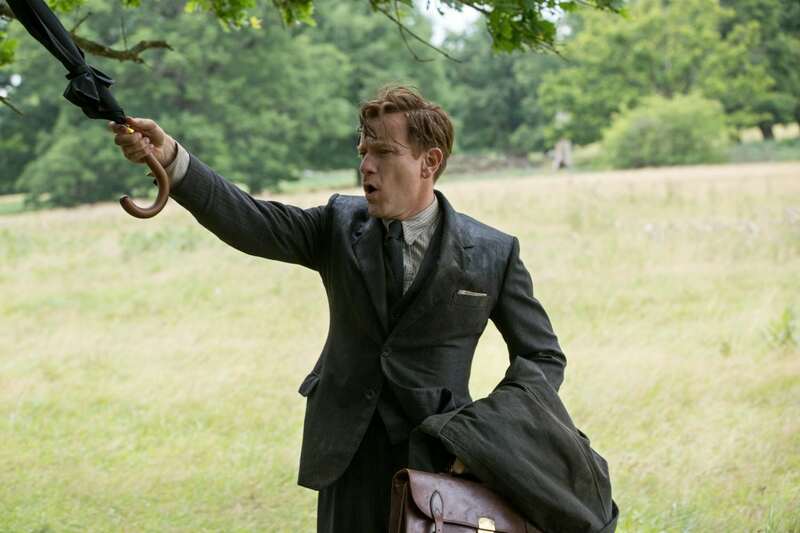 Through one reason or another, Christopher Robin is sort of not present at home. At that time probably men weren’t really expected or wouldn’t have thought about it. They would go to work and come home and the wife was looking after the kids and they probably wouldn’t be very close to your children, it made me think a lot about my dad. Because he was born in 1941 and I would imagine our daughter in this film was probably born around about then. And so his relationship with his dad was probably really quite like that. He went on to talk about how nowadays fathers are close to their children and how difficult it was for him to play a distant father at first. Those scenes at the beginning when I’m reading her a story and I go to tell her that I can’t come for the weekend and stuff it was difficult. I knew I wanted to be cold with her, it was quite difficult to do. My instincts were not that. He went on to say that everyone is going to find their own message in the movie and that is what is great about films. What is Ewan McGregor’s Favorite Line from the Movie? As we have all come to expect from a Winnie the Pooh movie, the lines that characters speak are full of wisdom and include some wonderful quotes. We had to has what his favorite one was. I mean it’s lovely saying silly old bear, there’s something nice about that. I also loved the scene with Bronte (Madeline) on the stairs at the end, when he sort of comes to the end of his realization that he’s not been the father he wants to be with her. And that he can see that she’s gone to all this trouble and danger for him. And that scene was lovely, those lines were nice to say, that he’s sorry. I really loved that scene as well. I might have spilled a few tears. Here is a fun little clip of Ewan McGregor as Christopher Robin with Winnie the Pooh. Get your tickets now, Christopher Robin is in theatres this Friday, August 3rd. For more fun coverage of Christopher Robin please read my experience at the red carpet premiere. I also invite you to check out our Facebook, Twitter, and Instagram channels where I posted more pictures and experiences from the red carpet.